A political meddling scandal threatening Canadian Prime Minister Justin Trudeau's re-election bid was given fresh impetus yesterday, with the release of messages and a secret recording supplied by his former attorney general. The House of Commons justice committee, looking into the explosive allegations that Trudeau officials pressured attorney general Jody Wilson-Raybould to shield engineering firm SNC-Lavalin from trial, released the materials from the now former official. The controversy comes just months ahead of a re-election bid that looks increasingly uncertain for Mr Trudeau, whose progressive, golden boy image had previously been unblemished. In the 43 pages of documents, Ms Wilson-Raybould seeks to link her demotion to another portfolio in January to her resistance to allegedly undue pressure to settle the SNC-Lavalin case - which Mr Trudeau and his staff have denied. And she hints about why, a month later, she resigned from cabinet, saying she had decided "that I would immediately resign if the new attorney general decided to issue a directive in the SNC-Lavalin matter". Her replacement as attorney general, David Lametti, has so far only said he is considering the issue. Montreal-based SNC-Lavalin was charged in 2015 with corruption over alleged bribes paid to secure contracts in Libya. Ms Wilson-Raybould, Canada's first indigenous attorney general, refused to ask prosecutors to settle, and the trial is set to proceed. But she later testified to lawmakers that she had faced "consistent and sustained" political pressure to intervene, including receiving "veiled threats" over her stance. Mr Trudeau recently addressed the allegations, telling reporters in Ottawa that he had learned "lessons" from the crisis - but denied any wrongdoing. Another minister quit in protest, and two senior officials in Trudeau's office accused of bullying Ms Wilson-Raybould also resigned since the scandal erupted in February. The secret recording made by Ms Wilson-Raybould of a 17-minute call in December with Canada's top bureaucrat, Clerk of the Privy Council Michael Wernick, supports her testimony to the justice committee last month. On the tape, she says Mr Trudeau's inner circle was on "dangerous ground" by attempting to interfere in the SNC-Lavalin prosecution. She also explains that she is only trying to protect Mr Trudeau from charges of political interference after the head of prosecutions had already decided to go ahead with the trial. Mr Wernick says the prime minister is "in a pretty firm frame of mind about this". "I am a bit worried," he goes on to say. "It is not a good idea for the prime minister and his attorney general to be at loggerheads." 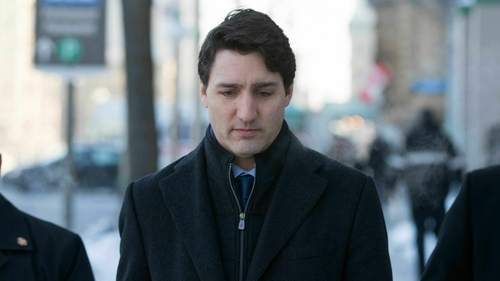 He highlights Mr Trudeau's concerns about the possible loss of 9,000 jobs and "a signature Canadian firm" if SNC-Lavalin is found guilty at trial and sanctioned, coming soon after a GM plant closure and Canadian oil sector woes. "The PM wants to be able to say that he has tried everything he can within a legitimate toolbox to try to head that off," he said. "He is quite determined." "I think he's gonna find a way to get it done one way or another." Divisions within the Liberal party have started to emerge as a result of the scandal, with several MPs publicly calling for Wilson-Raybould to be kicked out of caucus. Opposition parties, meanwhile, renewed their demands for a public inquiry and for Trudeau to resign. "The prime minister has lost the moral authority to govern and must resign," Tory leader Andrew Scheer said in a statement. According to the latest poll by Angus Reid, the Liberals have fallen nine points behind the main opposition, to 28%, versus 37% for the Tories. Smaller parties such as the New Democrats (17%), Greens (8%) and the upstart libertarian People's Party (4%), however, have been the main beneficiaries of the Liberals' loss of support.